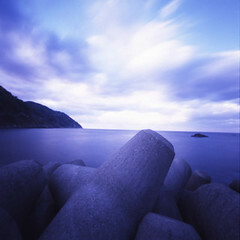 This photo is Pinhole photograph. It takes it applying the Pinhole board that remodels HOLGA120S and makes it for myself. The seashore with a tetrapod. Clouds flow and time flows. The evening which comes soon.